I receive many queries regarding quilt binding, specifically machine stitching the binding, and would like to clarify a few technical, but not difficult, binding matters. To determine the length of continuous binding needed I measure the quilt top and side, multiply by two, and add at least 25 inches. I am always rather overly generous here. Joining binding strips end to end . This is probably quite unnecessary but it does avoid tucks and puckering by movement of the two edges, when sewing the binding to the quilt. It is like a security blanket for me, just part of the process. I then sew the binding to the top of the quilt by aligning the zig zag edge of the binding with the raw edge of the quilt top, right sides together. I like to leave an approximate 7 inch tail of quilt binding at the beginning, and then sew with a 1/4 inch seam allowance all around. I miter the corners - this process is well documented in Amanda's binding tutorial, and also here. I use a stitch length of 3.0mm for this part of the process and a walking foot. I like to leave quite a large gap between the start and the end of the stitching, say 12 inches. You will have two lengthy tails leftover. Overlap the two tail ends smoothly along the quilt edge. by the width of the original binding strip plus 1/4 inch. In this case the tails overlap by 2.25 inches plus .25 - a total of 2.5 inches. Be sure to use a ruler and mark the binding for the correct measurement. To join the two ends with a diagonal seam unfold the binding. Place the two ends right sides together, perpendicular to each other. Allow the ends to overlap by a generous 1/8th of an inch as pictured . Secure strips with a pin. Mark a diagonal line as shown. You can now test to see if the binding fits along the quilt edge. Trim back the excess fabric, leaving a quarter inch seam allowance. Stitch the remaining binding onto the quilt as before. This method of joining the binding ends works for me each and every time. It leaves a much less bulky seam, and is just like all the other joins in the binding. Pin the binding to the back of the quilt so as to just overlap the stitching line made when sewing the binding to the front of the quilt. 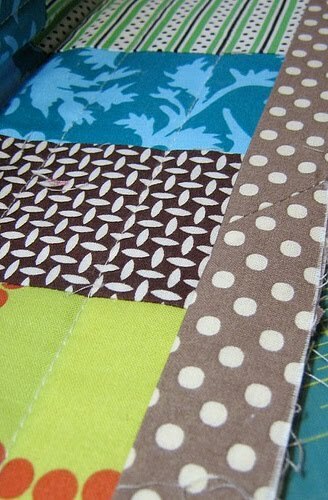 As you can see I use LOTS of pins, although I know of quilters who can do this without pinning! With bobbin thread to match the binding fabric and a top thread which blends well with the quilt top, stitch in the ditch along the binding seam line on the quilt TOP. By stitching over this seam line you are effectively hiding the top stitches. As you stitch the aim is to catch the outer edge of the binding at the back of the quilt. Remove pins as you approach them. Once one side is finished, pin the next side, going around until all the sides are finished. which you can either run through the machine again or hand stitch. Your technique will improve over time as you become familiar with the width of your binding and the pinning of your binding. Hopefully you will find this information useful. Feel free to ask any questions regarding binding and I will answer them in the comments section so as to make this information available to everyone. Thank you!! Your explanation is thorough and clear, which is good for this beginner. I really appreciate the time you spent putting this information on your blog. I'm still amazed that you can do it so well by machine. No such luck here. That's okay I enjoy the hand stitching. Great tutorial, especially about the joining of the end pieces. I'm one of the weirdos who enjoy hand stitching the binding hehe Besides, I can't ever machine stitch the binding as perfectly. I've tried this once before without much success but will definitely have another go now. Thanks for the excellent and detailed explanations. Great tutorial. I love that you have said to use the walking foot to sew the binding on, as that makes it look so much better. Thank you for posting this. I'm a beginner and my second quilt just didn't please me as much, mainly due to the binding. Your method sounds fairly easy. I think I'll try this on my next quilt. Brilliant! I wondered how they did that! I thought folks sewed it on the back and just sort of fell in the ditch.. I only machine bind so having another method in my pocket is good. I too absolutely hate hand stitching the binding! But I have tried to machine finish it too, but not very well. Perhaps your method of using lots of pins will see a better result for me next time- I am determined to master this! I have recently started using the 2.25" binding strips and I really like the results. I do my binding exactly this way, and I love it. You didn't mention, but do you iron the binding before pinning? I iron mine - once from the top side (to open the binding out) and then again from the back (while folding the binding over and into place). While ironing the second time, I clip it in place about every 6-8", using standard binding clips (instead of pins, but same idea). I never hear anyone mention ironing, but maybe it's just one of those things that's so obvious nobody thinks to say it? awesome awesome awesome! Thank you for making a post about this. 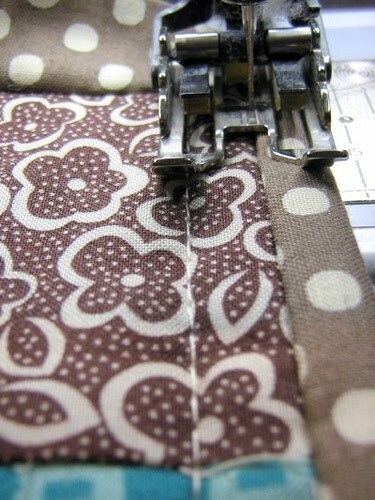 I've mastered the hand sewing of binding, but I'd love to try it with the machine. Thanks for the clear directions! I'm going to try this with a few little projects first! Evelyn - I do iron; my iron is always ready to go. I iron the binding strips, iron open the seams, iron to double over the binding strips, and iron again after the zig-zagging! Always with lots of steam too. Good question, I might edit my post to include the much presumed ironing. I don't mind hand stitching but I enjoy reading your blog to see how you do things as you are opposite of me - I do by hand, you do by machine. 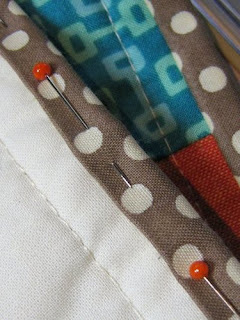 I do like the simple stitch approach that you use in machine quilting and like how you do your binding as well. I like seeing how you do it because I know what day I might get arthritis too much in my hands to continue doing it my way - I hope not of course but I just might practice your way now and then. Thanks so much for these instructions...Ive done this before but not with sewing the back binding down from the TOP of the quilt...eureka! This is a thorough tutorial .... thanks for taking the time to do it. I'm going to try my next binding (a Christmas tablerunner) totally by machine. I'm always amazed at how perfect your binding looks. I have tried machine stitching the binding before with so-so results. I picked up a coupleof tips from this post that might help me next time. Thank you! Hi Vee - no most of the images on this blog are of unwashed quilts. I do however wash the batting before I use it. I do this by soaking it in a no-rinse product called SOAK. I leave it to soak overnight in the bath tub, drain it the next morning, and spin in the washing machine. I then line dry the batting, but if I get impatient (like today! ), I will throw it in the dryer for 10 min just to finish the drying process. By washing and pre-shrinking the batting, the quilt will still be quite crinkle but not as much. 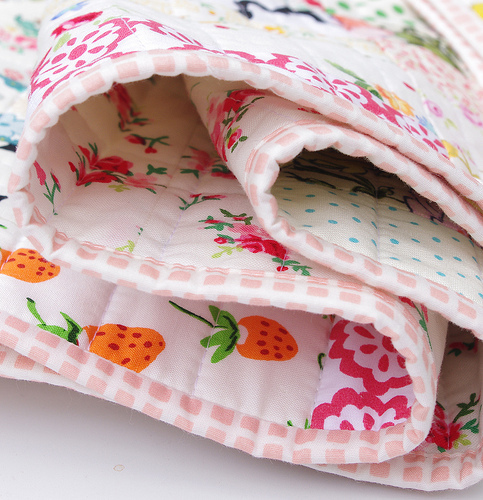 Also if crinkly is not your look, a warm steam iron will restore the quilt to its near original condition. 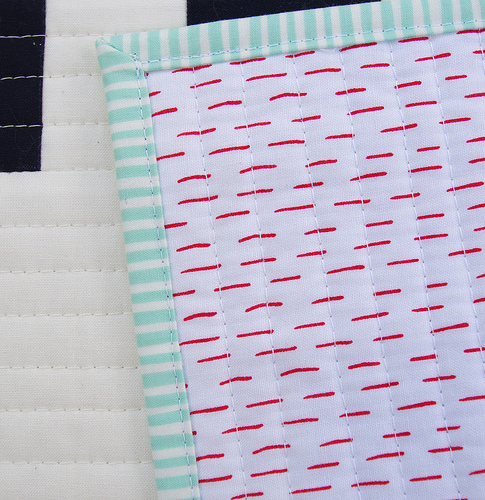 LOVE that last image of the red/white stripe binding...pretty! I haven't attempted a machine binding even though I really do not like binding by hand. Questions - you stitch corner to corner - any special treatment at the beginning and end of each length of stitching?? How are you removing those pins on the underside and keeping the binding in place? I might have to try this on something soon. Hi Jackie - I do 2 or 3 back stitches at each corner, ie at the start and at the end of each side, just to secure the stitch. I remove the pins just before I get to them. 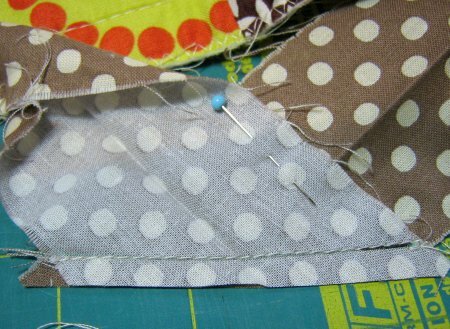 For a while there I was using pins with a flat plastic butterfly-like end,and invariably I would stitch over and right through the plastic ends, thereby attaching the pin to the quilt! I now use pins with a ball/round end, which as you approach make their presence felt! I also pin so the the pins are easy to remove; with the sharp end of the pin pointing in the direction of where you start stitching (top end of the stitching line). Rita - this is great - I am going to have to try this now - and thanks for the tip on attaching the two ends - somehow I never could get it right - great tutorial!! Thank you for the tutorial! Wow, though, it hurts my brain to think about! :o) I want to machine bind, but have always been afraid to do it. And I've got a few Christmas projects that don't involve binding before I move onto some baby quilts, so I'm going to file this tutorial away, and HOPEFULLY put it to good use in the new year! Thank you! I cannot stand hand stitching...I don't have the patience and really can't do it well. I've been either using a zigzag or blanket stitch but realized with my last quilt that I probably could do it as you suggest. I had a number of gaps and was disappointed with what I thought was going to be an easy technique. I'm glad to know that, if I keep trying, I might be able to pull it off eventually! Thank you! Thanks so much for this tutorial. I have been wanting to sew on a binding by machine for eons, but never managed to do it successfully. Now I know what I was doing wrong! Can you tell me what you do on the corners of the quilt that were mitered? Thanks for the tutorial. I machine stitched my last quilt binding and it turned out nice enough but I can see this method will give much cleaner, better results. Looking forward to trying it soon. I went and looked at Crazy Mom's tutorial. She puts the binding on BEFORE trimming the batting and backing! I have never seen this done before and it seems weird to me. It looks in the photos like you trim before binding - is this true? Also, do you stay stitch the edge of your quilt sandwich before binding? Sarah (Freckles + Fairytales) and I were just talking about this at a quilt show this weekend. She said you would be posting and i'm so glad. I have only tried this once or twice, but never with much success. Your explanation makes perfect sense and I look forward to a project to try it on. Thank you for sharing your binding technique! You are an inspiration! Thanks so much for sharing your technique. Your bindings always look perfect! While I like hand stitching bindings, I have been looking for a machine technique for those times when I need something faster. I'll give your method a try. Thanks again! Thanks for the excellent tutorial, I'm just about to start binding my first quilt so this is great timing. Your binding always looks so neat. Love the new quilt, I think the baby boy who its for will love it. Thank you for this! So clear and easy to follow! I dread hand stitching the binding, but I haven't had success with machine sewing it. Going to try again, armed with this, printed out and handy. I am thinking of trying a trick that I use for sewing zippers, which is to stick them down with 1/4-inch double-stick tape. What do you think of doing that with the binding? To insure that the binding on back is over the stitch line. 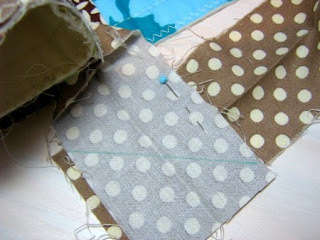 Great tutorial I also used Amanda Jean's I like your now too because you added the machine binding and not hand stitching! Excellent tutorial...and perfect timing. I just sewed the top of the binding to my quilt...and was dreading the hand stiching. Already done with one side of the quilt based on your easy instructions. Thank you! I had a blinding light bulb moment while looking at your tutorial--of course, how simple, why was I doing it by hand. Luckily I had a quilt that was ABB (all but binding) and I gave it a whirl. By the end I was rolling along with no pinning. Thank you so much for taking the time to put this tutorial up. 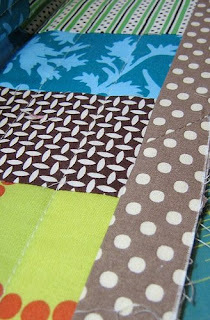 Love your quilts by the way--I'm not a stippling gal myself, so it's nice to see straight lines somewhere else! What a great tute! You are an inspiration to many, Rita, and this is a great way to bind a quilt. Thank you so much for this tutorial! it always amazes me how kind people can be to take time to help beginners. I am in the middle of my first pass at binding a pot holder (a quilt seemed too daunting!) and was about to start hand stitching, but I think i will go with machine. Thanks again! Thank you, thank you, thank you. I am definately going to try this on the table runners I am making for christmas pressies. Your tutorial was clear and well stepped out. Thanks again. OHHH! It took me 4 reads to understand what you were doing, but now I do it is glaringly obvious and I have to try this! I would love to be able to avoid the hand sewing part and often wondered how quilters get it to all light up. This makes a lot of sense. I'm not sure if i 100% understand how you manage to diagonally sew the overlap, but I will give that a try too next time. I have tried this unsuccessfully a couple of times but have just managed to finally get it right by NOT using any pins. I ended up just folding under as I went along and using my nails to feel for the right position. Thanks so much for all the other bits like the zig-zag bit and the stitch length bits and the diagonal joining bits. All have made my binding so much neater. Just did my first machine sewn binding class for Maragret's Hope Chest a few weeks ago. Then saw that she mentioned this tutorial. Wish I'd seen it first. Especially can't wait to try the joining method you use. Brilliant! Thanks for posting this tutorial!!! thanks so much for this tutorial! i do love hand stitching binding, but you make this look so good and easy...i'm going to try it on a little project. thanks for linking to my tutorial, as well! I once saw a YouTube binding tutorial where the lady glued the binding down to help keep everything in place. I've adopted this technique for both hand and machine stitching the binding on. I sew the binding onto the top, then iron it over to the back side. I put a thin line of Elmer's white school glue along the quilt (within the binding seam from the top) and iron press the binding down, setting the glue. I still pin the corners to make sure they are neat, but the glue technique has really cleaned up my binding and reduces the need for all those pins (I always walk away from binding with 100 tiny holes in my finger tips). Also, I stock up on Elmer's glue during the back-to-school sales when it's 10 cents- a really cheap fix if you ask me! 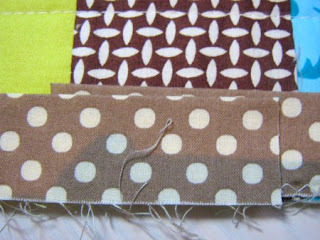 Thank you for this wonderful tutorial...it gave me the courage to try this on my first quilt....I did all the pinning too, but sadly there were a BUNCH of spots that I didn't catch all the way through. I figure, it's my first quilt, it's not perfect anyway. I will try this again on the next one!! Is this how you do all your binding? Thanks so much. I stumbled upon this when searching for tips for quilting newbies, and this is infinitely helpful. Just came back to this binding tutorial to refresh myself on your technique for joining the binding at the end. Brilliant!! Worked perfectly for me again. Cheers!! WOW! I usually have a hard time with written directions (am more of a visual learner) but this made absolute sense. I love the idea of not having to hand-stitch the other side of the binding. Thanks so much for the tutorial! I'm not known for patience, and anything I can do to get out of hand stitching the binding, i'm all for it! Thanks again! Have you tried the fusible thread in this process? I bought some at a recent quilt show. The proprietor said to use it in the bobbin when sewing on my binding. Then press the binding over and it adheres. This would hold it in place even more securely than the pins until you can do the second stitching around. Thanks for your tutorials! Very clear and great pictures. I just wanted to thank you for the information. I went to the fabric store on Friday and bought everything needed to make my first quilt. Slightly terrified, but I was mortified when I discovered I had to hand stitch the binding! I don't like sewing anything by hand...things will sit for months before I'll get out the needle and thread. I actually like hand binding but I've planned to make several quilts as Christmas gifts and was worried about time. This wil sooo help me!!! I have something wrong with my joints so hand binding just looks bad - i plan on making many patchwork and rag quilts - and selling them - do you find people are more critical of hand binding or machine? I tried doing more hand binding today and apart from the messieness it takes hours to get the feeling back in my hands! I love this tutorial as it is simple- but effective - and you do it oh so neatly. Thanks for this great tutorial. I have a baby quilt that is done except for the binding, so I'm excited about trying your method. One question--what do you do when you get to the corners? I gotta say that my favourite part of making a quilt is the binding EXACTLY the way you do. I find it sooo relaxing. I machine sew the first part, then grab my needle and thread and off upstairs to my favourite chair with a cup of coffee and hand-stitch for hours and hours. It keeps me toasty warm too and then.... I give it away as a gift. I haven't quilted in a loooong time. Just made the top of a denim quilt and I think I will put that together today. Thanks for inspiring me. This...is...awesome!!! And I couldn't have found it at a better time - I'm finishing a baby quilt for a girl I work with, and she's due in a week. I don't think I could have finished by hand in that amount of time, but I have one side sewn and another pinned to get back to after work tomorrow. Now as long as she doesn't go early! Thanks for the machine binding tutorial. I am trying this today! Thank you for the great tutorial. I enjoy hand stitching the binding down although sewing would make it more durable. Hi there! Thank you for this tutorial. I have a different way to bind but find the zig zagging and the machine binding part intriguing! I LOVE to hand sew my binding but suffer from carpel tunnel on my entire right forearm. I HAVE to try this now! I found your blog a while ago and was just 'checking' in and am currently stash busting with a gajillion 2.5" and 2" squares so your blog has given me some ideas! Thank you so much! I definitely haven't figured out binding, but I'm all about using the machine. What a great little tutorial for how to bind.. I didn't know there was so many different ways. Hopefully this will help with my corners! Kudos. Great tutorial - Binding is the part that never gets done unless it is completed with binding by machine. I found this tutorial really good. Upon reading it I found I'd forgotten to trim back the binding tails so that they overlap by the width of the original binding strip plus 1/4 inch, and then couldn't figure out why it was too big. The other problem was that I was binding a mug rug, and you can't leave that much to finish it off, but managed to work that bit out through trial and error. So your tute was a good reminder of what I had to do. So glad I found this tutorial! I was going to purchase a little gadget that helps with binding. However, after reading this, I can save my money! Thank you so much! I linked to your tutorial on my mug rug tutorial because it's so useful, but I just wanted to let you know! Just as I was going to email you to see about your machine binding technique, I found the tutorial, thanks so much for the info and I cannot wait to try it out on my next quilts. Thanks for this great tutorial. I think I'm going to try this on a mug rug this week. I have two questions though: 1. 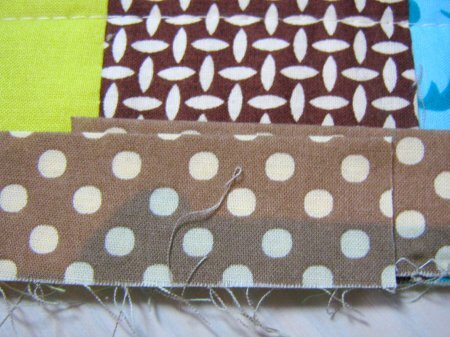 )Do you trim your quilt to right along the edge of your quilt top or do you leave a little extra batting along the edge and 2.) 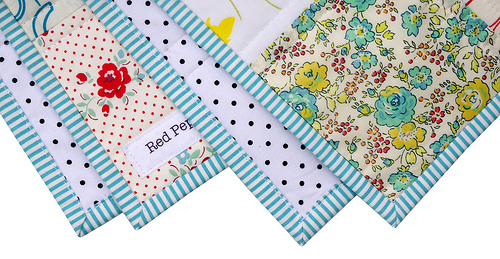 How do you handle the quilt corners with the machine binding? Thank you! I just completed my very first machine binding and it came out perfect (ok, not perfect but it's still way good!). It's for a charity auction this weekend, and thanks to your tut on machine binding I was able to finish it! LOVE this way of binding a quilt!! I like you do not like to hand sew my binding. I also found that I like to pin on the front of the quilt then I can see if I need to make adjustments to the back spacing, and the pins are easier to remove. And yes lots of pins are needed. Just finished the Alice quilt and it can out so cute. I don't like stitching but I very enjoyed your blog and also enjoying this because I do by hands and you do by machine, I like only simple stitch approach with the use of machine! Thank you so much for this well-written tutorial. Hand-stitching binding makes me crazy! I'm going to try this instead. Sorry to comment on an old post/tutorial, but THANK YOU! I'm a beginner quilter & my first project was a small baby quilt that took me days to bind by hand (and the end result wasn't that spectacular either!). My second quilt was significantly larger and I dreaded to think of the weeks I was likely to spend slaving over the binding. Thanks to your tutorial, I just finished the binding on this bigger quilt in a matter of 2 hours! And it looks a LOT more polished than my hand binding effort, let me tell you! With 4.5 weeks until my baby is due, I can use the time I've saved to make her another small baby quilt! As for the technical aspects of the process, I found the pinning to be quite tedious, but much less tedious than going back to fix areas where the back binding didn't get caught by the stitches, so it's definitely worth taking the time to pin properly. Practice definitely makes perfect too. By the 4th edge of my quilt, I was concealing the stitches in the ditch on the front and also not missing any areas of the binding on the back! Huge thanks again for such a brilliant tutorial! Thank you for this explanation. This is generally how I bind a quilt but I was missing the all important last step of stitching the back of the binding on from the front and keeping that stitch in the ditch. You're awesome. Thank you. I have completed many quilts and I must say, that I always have trouble with the last part, where you sew the two ends together. I ALWAYS have to look up that part on line. I can't seem to master it. Thanks for the easy to follow, concise instructions. I shall refer to your blog in the future when I come to that part of binding. Thank you! If I could reach you I would hug you right now! Thanks for writing this tutorial. I followed your steps exactly and attached the best binding I have ever done by machine. Thank you!! I am up to the binding of another quilt and I am just popping by to check out your wonderful tute. I come back to this binding tutorial every.single.time. Thank you so much! Thank you, THANK YOU!!!! I have struggled with this step of the binding over and over again. I've ripped out way too many times...for some reason you have clarified whatever I had muddied in my brain...again, Thank you!!! I love your tutorial! I didn't think I could ever do this, but after machine stitching the binding on 24 potholders, I really improved my technique :) Next task - to try a quilt. Going to give it a try today...I havent bound a quilt properly yet! Or at least with results I like, I am tooo picky I guess. Your explanation is great though and I loved all the pictures! I love this tutorial - it is the Best Ever! Looks fabulous and saves so much time. Is it okay if I include it on my "Tutorials I Love" page - totally linked back to you here? 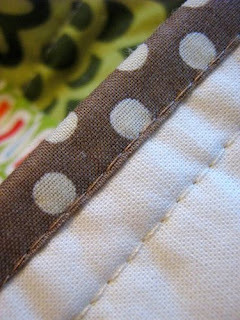 Do you always use a 1/4 seam allowance, even if you use the 2.5" binding? I guess my main question is how do you know what seam allowance to use when you first sew the binding on? This is a great tutorial. I always refer to it when I am binding a quilt. Thanks! Oh what an excellent tutorial!! I know I can "DO" this now, Thank you sew (hahaha pun intended) MUCH!! Thanks so much for the tutorial, I finally got it!!! Thank you so much for the excellent tutorial! Thankyou for your very informative machie binding post. I have two quilts away being quilted at the moment so i can't wait to try this method as I have always hand stitched the binding but it would be so much quicker to machine bind and then move on the next project. Hi, I found you through Pinterest. I tried your binding technique tonight on a quilt that I needed done in a hurry. I actually had better result by not pinning, just tucking around and sewing an inch or two at a time. It didn't give quite the nice finished look I like and get from hand sewing but the quilt is done and out the door in the morning! Yeah!! Thanks for a great tute. This is a great tutorial! I have used it twice now, and it worked like a champ! I've always preferred hand-binding, but for charity quilts and baby quilts that will be washed all the time, this makes so much more sense to me, and it looks great! Thanks for sharing your knowledge! This part of the quilt making process has been my Achilles heel throughout over a dozen quilts. After having watched a bazillions tutorials on the Internet and read a few bazillion more, yours has finally helped me crack the code...Thank you, thank you, thank you! I can now reach the end of attaching the binding without a sickening knot in my stomach! Hi, thank you so much for this tutorial - I know how long they take to do! I love this as it is easy to understand with great pics to help along the way. I usually bind by bringing my backing fabric over to the top and I hand quilt so I just sew on around but you have given me some inspiration to try machine quilting (I am disabled and am struggling to quilt for any length of time right now). I did try doing a few blocks on the machine the other day and they were so much easier for me. I am making one quilt I will complete by hand - a gift for my sister-in-law, a memory quilt representing her daughter my niece who was murdered at the age of 15. Anyhow thanks once again the super tute and now I will get back to my newest creation, a door stop made from used rice bags which I am also doing a tute for. Btw - Lurve your work! THANK YOU! I had pains just thinking about hand stitching the back of a king size quilt. I have always wondered how machine stitching the binding works ! Thank you and thank you also for clearly explaining the diagonal join of the binding at the end. I could never get this right. Will try again now. Thank you so much for this tutorial. Although I do not machine stitch my binding - I still handstitch, the directions on how to join the strips together smoothly is PRICELESS. I pinned this and refer to it every time I bind a quilt. Who knows? Maybe someday I'll even try the machine stitching too. Thank you for this tutorial! I refer to it every time I bind a quilt. The instructions are very easy to follow and my binding always comes out perfectly. Thank you for this tutorial! I just tried it and it resulted in the best quilt binding I have ever done! Thank you! I just tried it last night and did my first machine binding! The corners didn't catch well, but I'm sold! Thank you so much for all this info. I have just sewn my first quilt binding onto my first ever quilt. I'll hand sew it finished, but will try machine sewing it finished another time. Ah Ha! I had to read through it a couple of times to catch the part about stitching in the ditch from the TOP. Makes more sense now and can't wait to try it out on my next quilt as I am no fan of hand-stitching. Thanks so much for posting! You're quilts are always so beautiful and I'm amazed at how quickly they come together. I tried this on my most recent baby quilt and it worked beautifully! Well, I did need to go over a few missed spots, but as far as I'm concerned it turned out really well and has saved me HOURS of hand binding, so thank you! I'm never going back :). Thanks Rita: I used this on some placemats.. with success!! Thank you for sharing this. You are my hero! Tried it. Loved it. Changed my life. 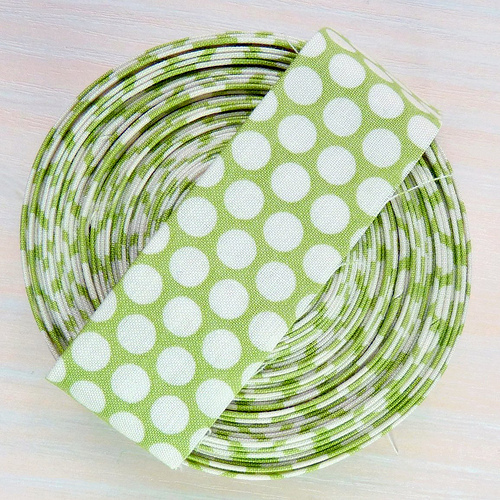 I just bound 6 placemats this way, and it worked beautifully. Thanks so much for the tutorial. I will never handstitch a binding again. Rita, I have done both hand stitch the finish, and also machine. I read this tutorial years ago, and had not really made the connection because I was not really "there" in my quilting development. Well, One thing. I love the machine quilting. Hand quilting is ONLY great when I go to the doctor with my parents (both 92) and sit for hours.... especially that retina doc for mom's macular degeneration (holy cow) Anyway, another cool thing with machine binding is that you can make a double row of stitching on some things and it looks great! Thanks for the info! I like the sound of your way to stitch the binding on. I had been sewing the binding on the back of the quilt first and then stitching it to the front of the quilt. Your way will make it much easier to trim down the excess backing/batting. I do not like hand sewing the binding either,so I do machine stitching with a fancy stitch ,I love how it looks , but if i am sewing with my Mom I let her do the hand stitching as she love to do that while watching her TV shows. I've only been quilting a year. I liked what I read that unless you are showing your quilt, machine bind it. It will last much longer, especially it'd it's will get washed often, for a child or table runner! 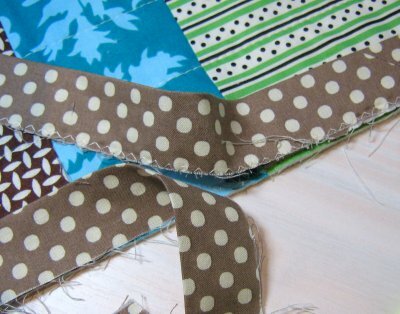 Rita, thank you so much for the great tutorial on machine sew binding. I have always done a bias-handsewn binding. Since I was making a baby quilt and figured it would go through many washings, I wanted to sew it entirely by machine. Even on the first go-around I was able to cut the crossgrain strips at 2.25 inches and it turned out perfect. Thank you for sharing your expertise! YES - YES, finally a binding tutorial with photos on how to put the two binding ends together. Way better than the tuck it under method. I'm pinning this....and probably printing it, too. Thank you!!! This is awesome! As a quilter for over 30 years, I've hand stitched a lot of binding. I've been wanting to try this and with your tutorial, I'm ready to give it a try! Thanks!! Hi Rita! Thank you for this! I always love the look of your quilts, the precision is amazing! Do you have other blog posts where you talk about your tools, steps, processes etc? Like what iron you use, ironing board, machine etc. and when you do iron and do you iron seams open or to one side alternating rows etc. I would love to glean from you anything about your how-to, because I truly admire your work. Please send me to other links in your blog about any of this, or consider doing a post on "Rita's how-to" thank you for your contribution to the sewing world! You are appreciated! I usually finish my binding by hand, but I needed a quickie method and used your wonderful tutorial with one small change. Instead of pinning, which I despise--I always manage to draw blood!-- I glue basted the binding. It was absolute perfection. Thanks for your excellent tutorials and for sharing your makes with the online world.